Since its founding, Dapper Classics has helped men achieve sartorial success with its timeless collection of dress socks. While important, stylish hosiery is but one component of a complete look. A dapper man pays attention to the details from head to toe. There should come a time in every man’s life when he starts taking his haircuts seriously. When this time comes—and it should come sooner rather than later—it is essential to find a skilled barber who you can trust. Recently, Esquire published a helpful article that discusses the 7 rules to ensuring a perfect haircut. The article emphasize the importance of finding a barbershop that fits your aesthetic and the significance of maintaining open communication with your barber. 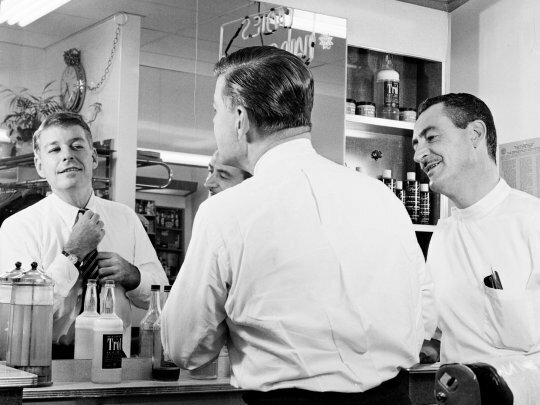 The Art of Manliness blog has a good article that details specific communication (e.g. nape and taper preferences) that should take place between a man and his barber. They have published a number of other useful articles on hair grooming, including one that addresses hairstyles for gentlemen who are balding. Dapper Classics is proud to have partnered with Attention to Detail (ATD) Barber Gallery, a high-end barbershop in San Francisco, California. ATD sets a new standard for the barbershop experience with its chic design and first-class customer service. In addition to offering a variety of grooming services, ATD carries a selection of fine men’s accessories—including Dapper Classics socks and American-Made, hand-crafted ties from Louis Walton. Remember, a dapper man is a well-groomed man.